What a rush to this story! Ok I’m getting ahead of myself. A group of trouble teens is dropped off in the woods for a weekend of surviving on their own. While their teacher watches from afar. There is already tension and animosity among the teens, but being away from adults unleashes it all. But as night falls, things start happening. Guns come out, pants drop, and people change. 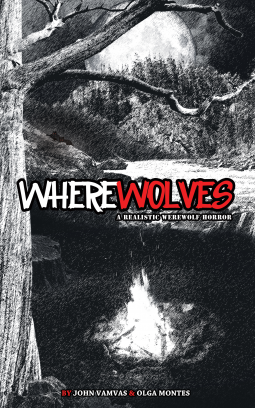 Around the camp fire the teens talk about werewolves and how one of them could be one. Doris and Jeffery the geeks are in their element. It becomes clear that something or someone is watching them as the night progresses. It doesn’t take long for the teens to start turning on each other, not trusting, afraid and confused as to what is happening. Can they survive the weekend? Can they survive themselves? This is a fast paced ride through blood and guts. Being a child of the 80′s and growing up on movies like this one, took me home! The best thing about this book, it’s written for the big screen. I found myself caught up in this book, trying to picture how it would look on the big screen. The plot is well scripted and kept me guessing all the way up to the end. Honestly, I’m surprised I didn’t faint from reading this book as many times as I held my breath. The story pulled me in and made me one of the teens in the story, I was caught up in the action, fearing for my life. The down side for me, to many kids – 18. I had a hard time remember who was who and who was together, I knew who hated who, that was easy.